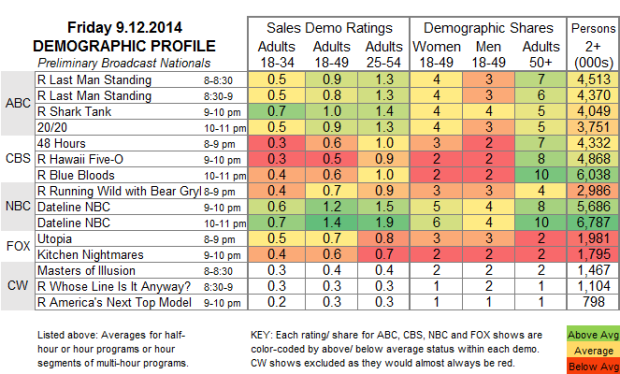 FOX: UTOPIA fell again, down 0.2 from its Tuesday rating to 0.7, and only managing to tie a rerun on NBC for 2d place in its hour. Once regular season competition arrives in 10 days, it seems unlikely that FOX will be able to devote 2 primetime hours to such a low-rated series every week. KITCHEN NIGHTMARES was even worse at 0.6. NBC: DATELINE was up a substantial 0.4 from last week to 1.3, after 0.7 for a RUNNING WILD rerun. ABC: 20/20 dropped 0.2 from last week to 0.9. a tick below the SHARK TANK rerun that preceded it. CBS: After 0.6 for an hour of 48 HOURS, reruns were at 0.5/0.6. CW: MASTERS OF ILLUSION slipped 0.1 to 0.3, same as the WHOSE LINE IS IT ANYWAY rerun that followed it. College football airs on 3 broadcast networks tonight, while CBS burns off the last 2 hours of RECKLESS. On Sunday, ABC counters SUNDAY NIGHT FOOTBALL and the 2-hour season finale of UNFORGETTABLE with the MISS AMERICA PAGEANT.